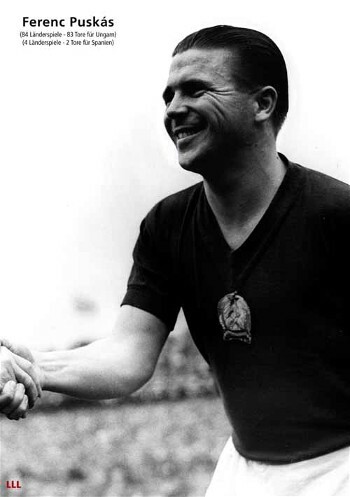 Nickname: "The Galloping Major" | "Öcsi" | "Pancho"
A highly feared player in his time, Ferenc Puskas is remembered as an exceptional schemer and extraordinary goal-scorer rolled into one. He is possibly the only footballer to have represented two countries in the international arena. For native Hungary, Puskas scored 83 goals in 84 internationals and orchestrated the nation's unbeaten run of success of 28 victories and four draws that stretched to four years - from June 1950 till the final of the 1954 World Cup in Switzerland where the Germans recovered to clinch the issue 3-2. Short, stocky and barrel-chested, Puskas' exploits were accentuated by the fact that he used only his left-foot and couldn't really head the ball. Born in Budapest on April 2, 1927, "Ocsi" (means little man), as he was known, joined suburban club Kispest and graduated to its first team at the age of 16. Most of this club's players were roped in when the military club Honved was founded and went on to become the inventory of Hungarian talent. Puskas made his international debut in 1945, in the 5-2 victory over Austria. The gold in the '52 Helsinki Olympics was a highpoint. The side then broke the home record of England with that memorable 6-3 victory at Wembley and reasserted its supremacy with a 7-1 verdict in the return game in Budapest. The team came to be known as the 'Magnificent Magyars' and Puskas the 'Galloping Major' for his Army rank as he played for a military team. An ankle injury in the group match against West Germany laid Puskas low for most of the remaining part of the competition, including the 'Battle of Berne' quarterfinal against Brazil and the semifinals against Uruguay. But he lit up the final with his magnificence, even if hampered by the injury. He unleashed a powerful left-footer as Hungary was up 2-0 in no time. That the Germans came back is another matter altogether. Nevertheless, had only Puskas' long-ranger not been disallowed as 'off-side' - a decision that is till this day argued - it would have been the equaliser, and the tale might well have been different. 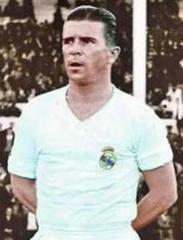 Puskas made four international appearances for his adopted country, Spain, after he went into exile with his family after the people's uprising back home in 1956. He forged a formidable combination with Alfredo di Stefano for Real Madrid from the 1958/59 season and the club supporters nicknamed him "Canoncito Pum", meaning the booming cannon. Puskas emerged top-scorer four times in the Spanish league, helped his team win six domestic titles and three European Cups, highlighted by his four goals in Madrid's 7-3 victory over Eintracht Frankfurt in the Cup final in '60. He played his last international for Spain in the '62 World Championship in Chile. After retirement Puskas tried his hand in coaching. He in fact had a stint with the Hungarian National squad. Updated, SPA 85 -->90, SPS 83 -->81..
Može LPS veći, al ATT je u redu na trenutnoj vrijednosti za mene.. Okay, I was thinking about posting this but I don't know why I never posted. And I'd like to suggest: MagicDip's set here, in Stat Practice for Real Madrid era. Nicknames: "The Galloping Major" , "Cañoncito Pum Pum"
Please watch this formidable kick corner! Meybe his curling should to be more and more than 79!